Day Zero List Makers actively work on their lists and support others working on their goals. See my DZLM page for all the members’ lists. hey, just letting you know i have been updating my blog and linked your blog on my ‘Fellow 101er’s’ page. :) I enjoy reading your blog and seeing you achieve your goals! It is an inspiration to keep going. hi again! don’t worry, we can definitely steal each other’s goals. oh, and ive added you to my list of friends. I love your list :) And all that you’ve put into it! Would you like to link me? I’ll link back! 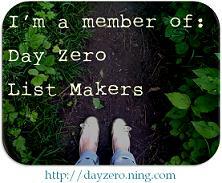 Have you checked out Day Zero List Makers yet?